A few years ago, National Geographic went on an expedition of sorts, to find the girl whose face they had made famous back in the summer of 1985, and as you can see in the picture above… they found her. What has become of her life, and what has happened since that day is chronicled in the article and shown on video. 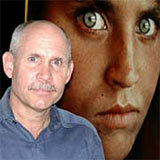 Her name is Sharbat Gula and she is married with children – three to be exact. I won’t go into too much detail here because I think it is worth reading – from the original source. The story is very informative, and with the recent events concerning Afghanistan and “the west”, I thought it a good idea to show people this story and remind them of the girl they all remember but don’t really know. As for me, this was probably the first National Geographic issue/image I ever held. I was less than a month on earth when the original was published, but my mother collected the issues and had this one in a box. I discovered the picture at the age of three while going through stuff I probably should have. From that day forth I too was a collector. And although I didn’t ever read the actual article till much later, there was something about ”the girl with the eyes” that stayed with me. Hey there I must say I revere your Ideals. As a Boston Cab driver I meet all kinds of exciting people and now I just can`t get enough. As soon as I drop off my Boston Taxi I come right home and fire up my idiot box looking for entertaining and informative blogs like this one. The next time you are around zip code 02127 South Boston Mastop by and see us! A hospital based milk bank is a much safer alternative. Donors can be tested to assure the safety of the milk.The milk can be frozen and stored in a controlled environment. Awesome post this will help me! Amazing, I found your site on Bing looking around for something completely unrelated and I really enjoyed your site. I will stop by again to read some more posts. Thanks! Good post, thank you. Could you tell us about the third paragraph in more detail? This is a amazing write-up, I came across your website looking around yahoo for a similar subject and found this. I couldnt get to much different information and facts on this bit of content, therefore it was awesome to find that one. I’ll certainly become back again to check out another posts you have another time. This is a amazing write-up, I discovered your site searching yahoo for the same subject and found this. I couldnt get to much different information and facts on this piece of content, so it was awesome to find this one. I will certainly become back again to check out another posts you have another time. This can be a amazing write-up, I came across your site searching yahoo for the same subject and found this. I couldnt reach much different knowledge about this bit of content, therefore it was awesome to find that one. I’ll certainly become back again to look at another posts that you have another time. I simply added your blog to my favorites. I really like analyzing your posts. Sure, doesn’t look like the same person to me. Nothing matches… the space between her eyes, the shape of her nose, the mouth, the shape of her face in general. Age, doesn’t change ypou all that much. She looks almost the same, the only difference is age. Her mouth has the same shape, her nose is not only shaped the same but has the same mark on the left side. The space between her eyes is the same, although her eyebrows are a little fuller which does fill a bit of it. The reason she looks so much different is her eyes are sunken in a bit and her face is fuller which makes the shape appear so much different. I will admit that I was a bit shocked and at first glance she looked like a different person, but with a bit of careful observation she is obviously the same. I agree completely. This is not the same girl. I agree with Chris she’s the same girl. The difference is this girl has turned into a woman, and the load of pain which has increased. This article doesn’t mention, but I think it is important to know how old she was in 1985, because if she was around 10, her facial structure is likely to have changed from a roundish child’s face to a woman’s. But if she was 20 in that picture, then I find it’s much less likely that her facial structure could have changed that much. is the same girl, eyes, nose, face configuration. hard life has treated her bad. thats not that girl …….the nose bridge and cornea color teeth socket varies a lot ……. the women is not that haunted eyes girl ……. Her eyes aren’t ‘haunted’, according to her they were angry. 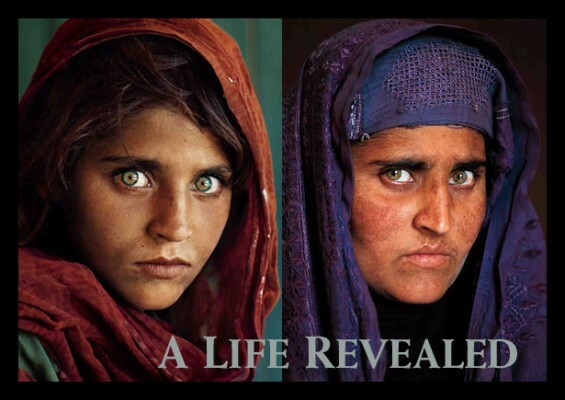 In her culture it’s not done to take a young girl’s photo, with her face uncovered and without permission. She was angry at the photographer for taking that photo and confused by the camera being shoved in her face. At least this is what she said when she was tracked down for the second picture and interviewed about the first. I was really interested to see this girl revisited by the media because I remember when the picture first emerged. It was on the cover of a National Geographic which my parents subscribed to. It was just another cover, like any other. There was no special hype or story compared to any other cover story (from what I remember) but for some reason the picture struck something in me and I never forgot it. I can’t remember a single other cover but I always remembered that one. I was only a bit younger than the girl and I remember her eyes amazing me. I didn’t see her anger or notice how dirty she was, I just thought she was a beautiful princess. I’m sad to see how she has aged. Life must be very hard for her. If you click on the original source it takes you to an article by National Geographic. One of the first things it mentions is that the photographer asked permission to take the girl’s photo. I think that is a lie as I have read an interview with this lady, from another source that is probably more recent (I think it may be more recent as it mentioned she had 5 kids, rather than just 3, which I think helps account more for her severe premature aging). According to the other interview (bear in mind the other was not National Geographic so had nothing to hide) her famous expression was born out of anger and shock that she was being photographed. She said she was NOT asked permission and that totally changes the context of the image for me. Instead of her steely gaze being born of a hideous and haunted life, it is merely a little girl momentarily enraged by an invasive act that must seem like molestation for a person of her culture. To have her photo taken with her face fully revealed might have seemed to her like a westerner feels having a peeping tom take her photo while she showers. That means the photo tells us less about how a child deals with life as an Afghani refugee in a Pakistani camp than if the photo were of a willing subject, unable to take her mind of her suffering long enough to pose for the camera. I’m sorry I can’t remember the source but I am sure that the context of what I read was exactly as I have written above. In my mind it makes a big difference. Also National Geographic probably could not admit that the photo was taken without consent as they would open themselves up to a lawsuit. Even if Sharbat herself wouldn’t think to sue them for royalties of such a (now) famous photo, some bright spark would see the new article and approach her with an offer (in return for a commission). 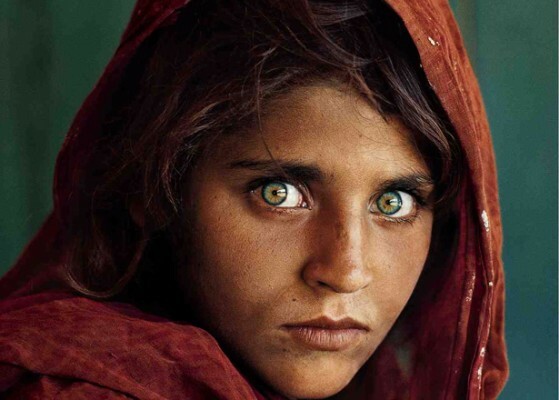 I also think the lie is probable as even National Geographic admit that Sharbat never had her photo taken either before they took theirs or even again afterwards until she was again approached by the magazine. That suggests to me that her culture or values do not permit photography of women (or perhaps anyone) and National Geographic has likely paid her for the recent snaps. I highly doubt she understands the shock value they wanted to exploit, focusing on how badly her looks have degenerated. I think she’d be insulted. I doubt they fully educated her about their motives or explained how widespread and famous reproductions of her first picture have become in the west. I think that that this is definitly the same girl. The hard work treated her life very much. This is one of these pictures staying with me …forever. I think happened under ordinary circumstance with modest planings, against all odds. Priceless. Its the same girl turned as a woman. eyes , nose , every thing same. wow, i love the the way they have not been able to exploit your mind unlike the rest of us who just get sucked right in coz it makes us feel morally superior. You looked at it with a clrity of mind and saw the photo for what it was and what it meant probably meant to her. why can’t we have people like you telling us news or writing to millions instead of the prick heads who would do anything for a sensationalist angle on a story?